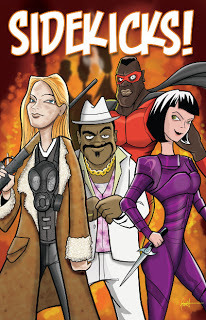 This anthology is about yup, you guessed it, Sidekicks. And every hero needs a sidekick, right? Someone who will support them no matter what, help them be the hero of our own story? Even if you’re not a hero, we all need someone like that in our life. I was expecting this anthology to be all stories starring super heroes having superhero adventures, cape and utility belt included. I was expecting the collection to be good, but not great, to speak to an audience of Batman and Superman and Thor fans that I just wasn’t a part of. Hey, guess what? Batman, Superman, Thor, all those heroes that I’m not all that interested in? This anthology isn’t interested in them either. For once, they aren’t in the spotlight. Sidekicks! wasn’t merely good or even great, it was flippin’ fantastic. I’m not so interested in superheroes doing superthings and getting superattention, but people who’d rather save the day from behind the scenes? Yeah, that I can totally get into. Most of them are about people doing the right thing (or believing they are doing the right thing), and getting too little credit for it. Not sure who the sidekick is in the story? It’s the person who is most selfless, the person least interested in the limelight. . . most of the time. Many of the stories are packed with emotion and depth, others are filled with fear and denial. In some the characters aren’t sure if they are on the good side or the bad side. You may not recognize many of the authors in the table of contents, but I guarantee this is a collection you’ll be thinking about for a while. Enough with the intro, let’s get to talking about just a few of my favorite stories! Hunter and Bagger, by Alex Bledsoe – This quickie opens with Ellen, who is tied to a chair in a shed. She realizes she’s been kidnapped by the infamous Headhunter, the serial killer who cuts women’s heads off. But it turns out The Headhunter isn’t one man, but two. The two men demand that the woman tell them which one of them is the villain, and which one is the sidekick. Is this a trick question? Does she get to live if she answers right? But how to tell, since the two men seem more interested in bickering with each other than acting heroic or in this case very villainous? If she’s going to get out of there, she’s going to have to think fast. And thinking fast is exactly what she does. These have got to be the dumbest, thickest idiot serial killers ever, and Ellen would be laughing her head off, if she wasn’t in her underwear, tied to a chair, in a shed with two lunatics.